`He orders his angels to protect you. I have set this scene during the day, perhaps mid morning. Sunlight illuminates this scene, coming from high up on the left. 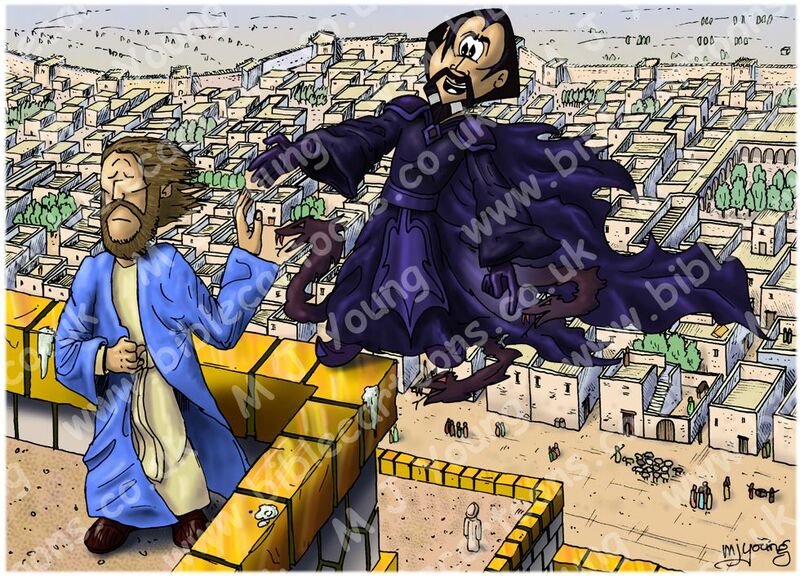 This is the second cartoon illustration I have drawn in this series of 6, showing the Temptation of Jesus the Christ by the Devil (or Satan.) As I noted in the first cartoon (scene 03 – Stones) this is the first time I have drawn a personified Satan character. In the past I have drawn sketches in which Satan is a dark, cloud-like figure, vaguely human in appearance. I had thought to keep Satan depicted in that way, since he doesn’t usually tempt humanity by appearing in a physical body at all. I wasn’t even certain that it would be right to draw him with a physical body. But in the end I thought it would make the picture more interesting & dynamic if we could clearly see him. Notice also that the Devil is standing on the edge of the Temple stonework, & also in mid-air! He is referred to as the “Prince of the power of the air” (Ephesians 2:2 (New King James Version)) so I thought it appropriate to show him standing on thin air! He is pointing downwards as an enticement for Jesus to jump off the Temple rooftop. 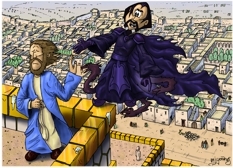 Jesus is standing firm & holding up his hand, rejecting Satan’s temptation, as he did in the previous scene. Notice the pigeon poo on the gold stones at the top of the temple! Is nothing sacred?! Notice also what Satan said to Jesus, he quoted from the Bible, but twisted the words for his own evil ends, trying to appealing to Jesus’ ego. What was this second temptation all about? In effect the Psalm is saying “If you follow God’s will (make the Most High your dwelling), then “no harm will befall you, no disaster will come near your tent.” By missing out verse 9-10, Satan was able to twist the meaning of Psalm 91 to his own evil ends, & tempt Jesus once again to operate outside His heavenly Father’s will. According to the psalmist, someone is protected only when they follow the Lord’s will. If Jesus had jumped off the temple rooftop in some dramatic display to show himself to be the Messiah then he would have been operating outside of God the Father’s will. Jesus response to this temptation was to quote from Deuteronomy (6:16) again, saying that it would not be proper to test God and to expect Him to do something outside of His will. Jesus knew that his Father could protect him; but he also understood the wider mission that all his actions were to be focused on, even if fulfilling that mission (of saving the human race & all of creation) would mean Jesus’ own suffering and death, which, of course, it did, when he went to the cross.